VisitFlorida.com - Florida's official tourism and travel site. FWC Manatee - Manatee site. Check with the Little Manatee if you want to see manatees with Canoe Outpost®. PaddleFLAUSA.com - Florida Professional Paddlesports Association. An index of outfitters in Florida. Greenways and Trails - Canoe trails in Florida. ProPaddle.com - Paddlesport Industry Association. Index to outfitters anywhere in America. ACA-Paddler.org - National paddlers organization. Find out about canoe and kayak certification, environmental issues and pending legislation. www.myfloridaclub.com - Find outdoor clubs of all kinds at this site. MusicLiveShere.com - The Spirit of the Suwannee Music Park offers camping, music festivals, and a large variety of recreational activities including horseback riding, swimming, canoeing, and more!. The Spirit of the Suwannee is located near Live Oak, Florida on over 600 acres of "Original Florida" on the historic Suwannee River. 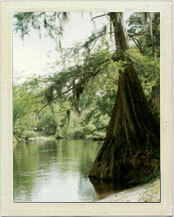 The Canoe Outpost-Suwannee River is located within the park.